And now for something completely different! Peter Hall needed trees to set the distinct scenes on his California layout. Read along to discover his techniques. Click on any image here to review a larger size. 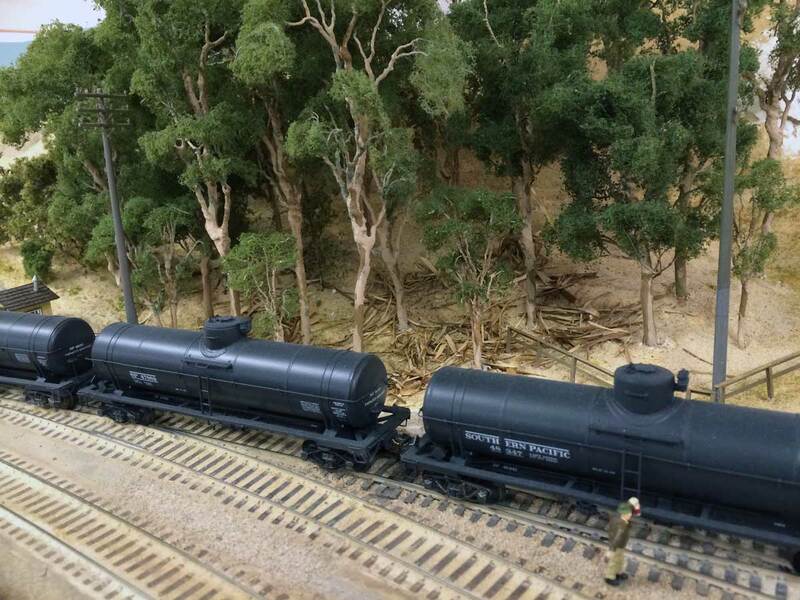 If you model prototype railroading in California, there is a good chance you will need to create good-looking Eucalyptus trees. I model the Southern Pacific Coast Line, and they seem to be everywhere, in groves of many trees or sometimes in lines along the right-of-way or a road. There is a thick grove of Eucalyptus across the tracks from the depot at San Luis Obispo. Since that is a prominent location on my layout, I have been searching for a model of Eucalyptus trees for many years, and I believe I’ve finally found one. Eucalyptus trees are not indigenous to California. 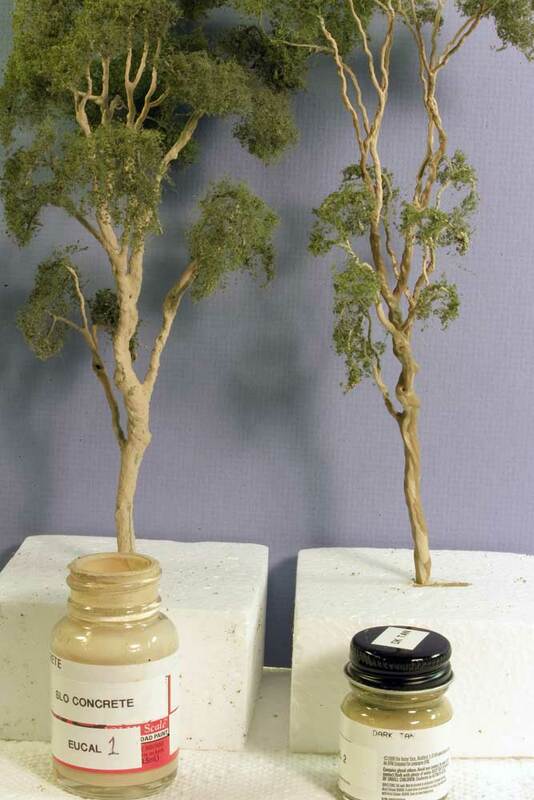 The trees were imported from Australia in the 19th Century to serve specific purposes. 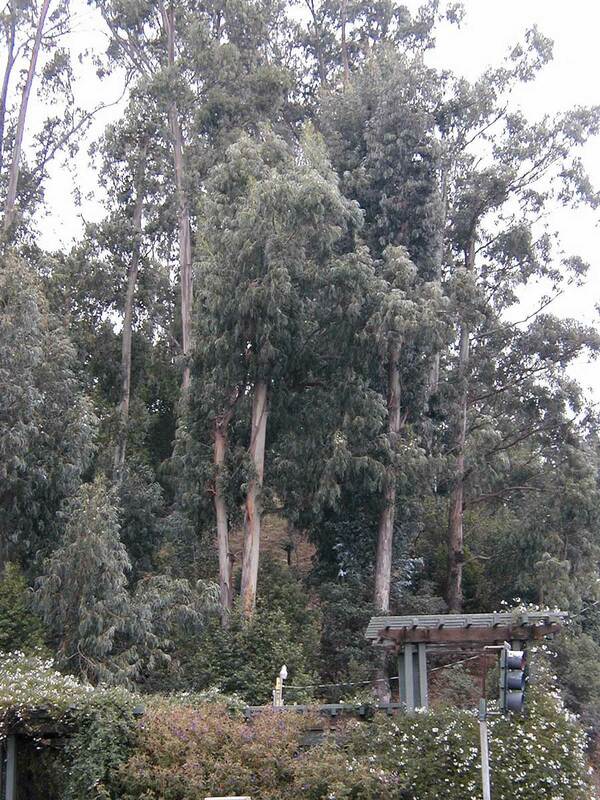 My research showed that there are more than 300 varieties of Eucalyptus trees, and even a casual glance shows many different varieties readily visible along the Southern Pacific Railroad. My research also showed one important fact: Eucalyptus is actually a GUM tree. That was the key to finding the right model. A new tree manufacturer, JTT Microscale, has produced an excellent example of the tall, breezy, somewhat drippy look of the Eucalyptus in their GUM trees. 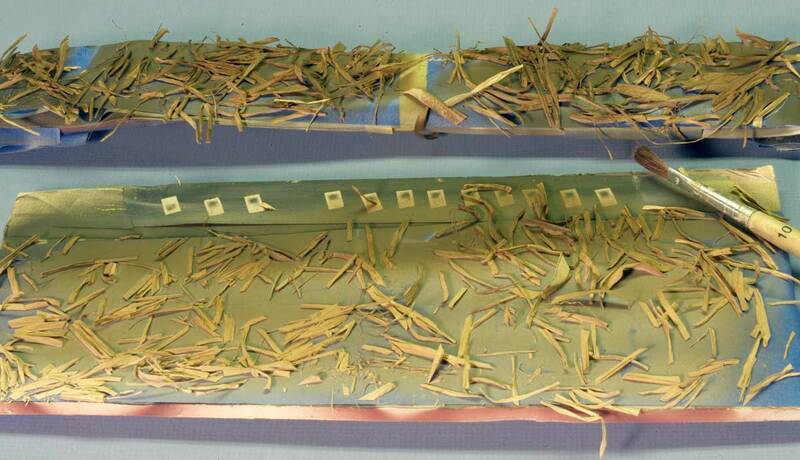 They come inserted into a foam block inside an attractive box that protects the model tree very well. These trees aren’t cheap, but they are very well done. As a disclaimer, I have no connection to JTT. Since they are made by hand, each tree is different. There are several different types and sizes of models, but they all start as a wire armature covered in a plaster-like material and painted in a nice grayish-green color. 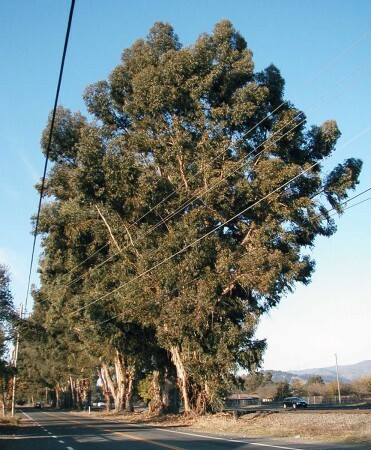 The armature is thin at the bottom and wide at the top, very much like a typical Eucalyptus. The foliage is particularly good for representing the airy look of the long, grayish-green leaves. But to me, the distinguishing prototype characteristic is the bark. Eucalyptus bark is light tan with a slightly pink tinge. A nice brown variegated bark flakes off and leaves considerable debris on the floor of the grove. Since there are so many types of Eucalyptus, I found that the JTT product best matched the tall, slender, single-trunked tree variety. Given the initial size and shape of the tree is a good match, the color characteristics can be added. I found the tallest model, the 8-inch tree (catalogue number 96055), was a great starting point. 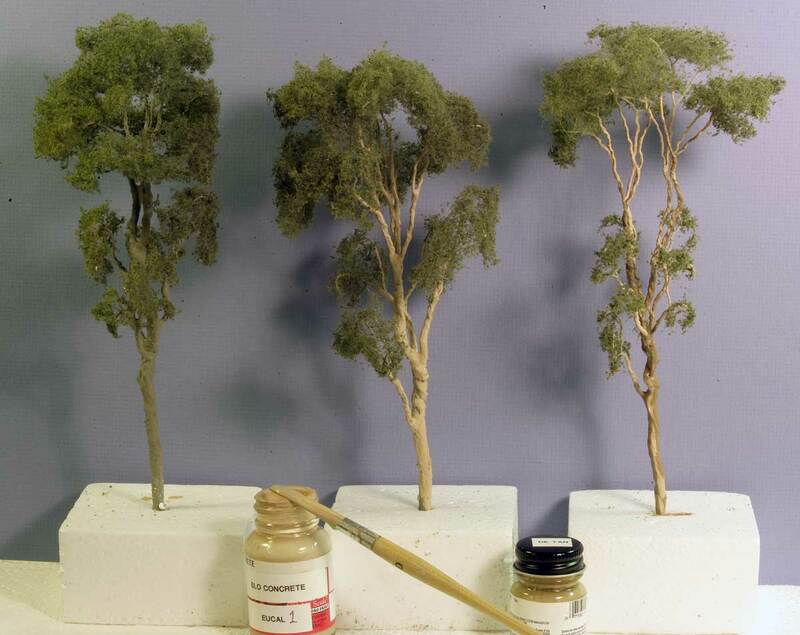 I set the trees on the workbench in their foam bases, and painted the trunks and branches with a mixture of acrylics. I mixed equal amounts of Model Masters “Sand” and “Gull Gray,” some “Reefer White,” and a few drops of Polly Scale “Flesh” to create a mixture with a slight pink tinge. In the photo, you can see the original tree on the left, painted with the first coat in the center, and with the darker swatches on the right. Polly Scale is no longer available, but Model Masters has a great variety of colors. Interestingly, I originally used this mixture to represent Concrete, and then discovered it was a good match for the Eucalyptus. I’m not too careful about a thorough coating of the paint on the trunk and branches, because some of the original gray is a good third color to include on the trunk. Once the tan paint was dry, I add swipes of Model Masters Dark Tan, again not too carefully, as the bark is variegated. The Dark Tan should be added in swatches all the way up into the branches. It’s fairly easy to get a thin paint brush inside the tree due to the wide spacing of the foliage and branches at the top. Here’s a closer look at the trees. 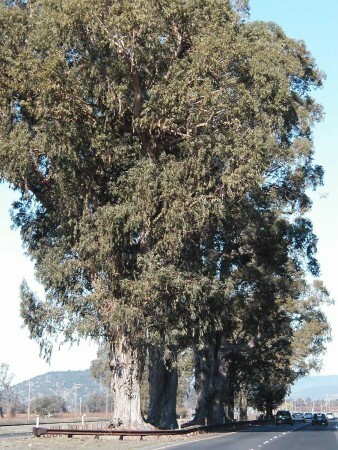 A key characteristic of a Eucalyptus grove is the considerable amount of debris on the floor of the grove. I looked around for a while in the workshop before deciding I needed help from the Superintendent, my Wife. I figured that being an artist and crafter, she would have an idea on what material would work, and I was right. She produced a skein of a material called “Raffia,” a grass grown in Madagascar. When dried, it is used by crafters as a filling for dolls and figures. The material looks like straw but it is softer and more pliable. 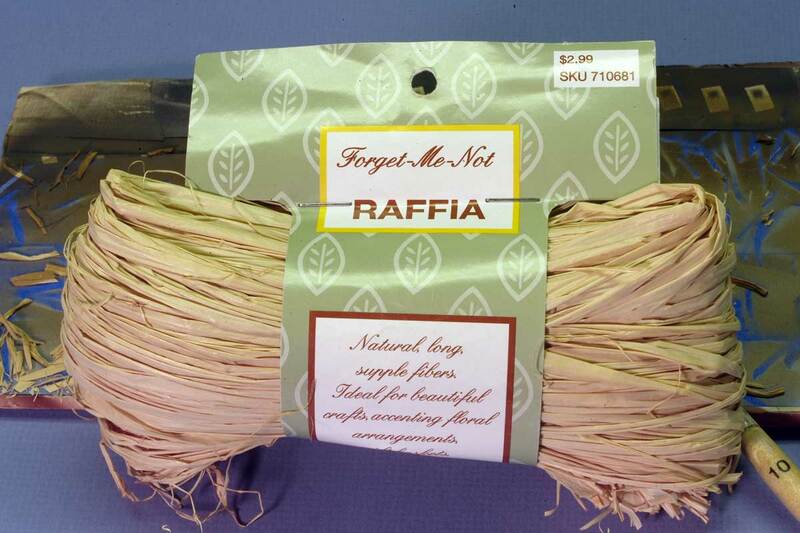 Raffia comes in a natural tan color that just needs a little help to become bark that has been shed by the trees. Since it comes as a long, thin, rope-like material, I cut a six-inch chunk and separated it into small segments. I cut the long slender ropes into HO scale three-to-eight-foot sections and made a pile of debris on a paper plate. I wanted to be able to spray the two trunk colors onto the debris, so I turned over a broad piece of masking tape and pressed it onto the pile. The Raffia stuck to the tape well enough to allow spraying paint onto the pile with an airbrush. I found that the light tan color was a good base, but that the Dark Tan was not dark enough. I added Acrylicos Vallejos Roof Brown to the mixture to create the darker color. In this photo the upper segment contains Raffia sprayed all brown; the lower segment is a combination of the tan and the brown colors. When the Raffia is removed from the tape, it has one dark side and one light side, and comes off in many different thicknesses and strands like the actual bark. I added the painted Raffia to the floor of the grove and found it simulated the debris very nicely. Take another look at the above model scene and compare it with the prototype tree images. I believe the JTT trees do a great job of representing Eucalyptus trees. Now, I just need to add that characteristic smell and the grove will be complete. Thanks to Peter for sharing tips to create a unique California Eucalyptus grove. Questions and comments can be posted below. Please follow the instructions so your comment can be posted. All comments are reviewed and approved before they appear. Tried to search the # 96005 but nothing. They do have a couple of others so they may have changed the product and numbering. Nice clinic. The additional paint really improves these trees. There are several articles on modeling and using eucalyptus trees in citrus groves on the Citrus Industry Modeling Group. Go to https://groups.yahoo.com/neo/groups/citrusmodeling/info and enter “eucalyptus” in the Search Conversations box. Nice idea for the creation of bark.